Photo Caption A: Berkeley College volunteers prepare meals for members of the Bronx community at Part of the Solution as part of Community Service Week, held throughout the week of May 21 to May 26, 2017. Part of the Solution assists individuals living in poverty on their journeys from crisis to stability and ultimately, self-sufficiency. 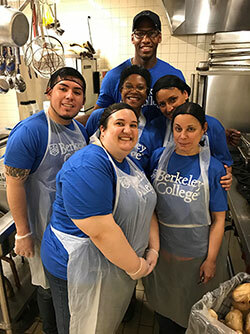 More than 400 Berkeley College faculty, staff, alumni and Honors students provided support to 43 nonprofit sites in New York and New Jersey as part of Community Service Week. The annual volunteerism event occurred throughout the week of May 21 to May 26, 2017. In the Bronx, NY, Berkeley College volunteers worked at the Food Bank for New York City – Hunts Point, as well as at Part of the Solution, an organization that assists individuals living in poverty on their journeys from crisis to stability and self-sufficiency. Photo Caption B: (Left) Berkeley College volunteers repack donated food items for families in need at the Food Bank for New York City – Hunts Point in the Bronx, NY, as part of Community Service Week, held throughout the week of May 21 to May 26, 2017. (Right) Michael J. Smith, President of Berkeley College, greets Berkeley College Honors students who volunteered at the Food Bank for New York City – Hunts Point.